Sharing our research with the general public, local community and patient groups is an important part of what we do. We want to help you to understand our work, to feel that it is important enough to investigate and to feel that you can ask us about it, take part in it or just comment on it whenever you like. 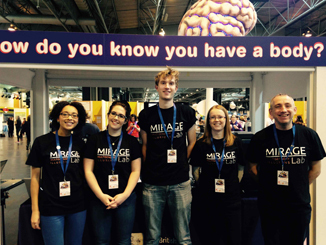 We have been involved in a lot of public engagement events since MIRAGE was invented in 2008. Our most recent events are listed below, but you can see a list of previous years’ events here. If you want to know more just write to us on the Contact Us page. 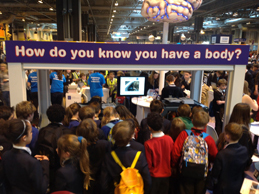 We have become a permanent fixture at the British Psychological Society’s stand at Big Bang Events, running hands-on demonstrations and interacting with children and adults. This year we stretched over 4,000 fingers. Tash, Ellen, Mark (with bed hair), Hayley and Roger. Left: blissfully unaware; right: totally swamped. The World of Illusions event was an adults-only night of short talks with interactive demonstrations held at Camera Obscura as part of the International Edinburgh Science Festival. This event was the second instalment of the Royal Institution’s new series of adults-only evening events filled with fantastic talks and interactive demonstrations. “Thinking Differently” was a workshop on autism held at Fernwood School, Nottingham which included talks and interactive demonstrations for parents, students and professionals. Bringing multisensory illusions to the public (2013-15). This project, funded by the British Psychological Society and carried out in association with researchers from the University of Edinburgh, installed an interactive MIRAGE at the Camera Obscura visitor attraction in Edinburgh.